ITHACA, New York, Jul 16 2012 (IPS) - Ecovillage at Ithaca (EVI), located in the beautiful Finger Lakes region of upstate New York, is an intentional community of 160 people striving for greater sustainability, a better quality of life, and perhaps even a new model for urban planners the world over. Enjoying breathtaking surroundings, residents wander around the village on pedestrian-only streets, swim in the pond, share meals in the common house, and spend a small amount of their time working together for their community. EVI’s residents have to volunteer for two hours every week in one of the six work teams – the cooking team, the dishwashing team, the common house cleanup team, the outdoor maintenance team, the regular maintenance team, or the finance team. “If you had a house, you would have to do that anyway, so why not do it for the broader community and make friends at the same time,” Ashley Click, a young mother and new resident at EVI, told IPS. The ecovillage’s houses, which are smaller than the U.S. average, are grouped together, allowing 90 percent of the village’s territory to be kept pristine. “When we densely cluster our houses on just a few acres, it allows for all this beautiful natural environment,” Liz Walker, one of EVI’s co-founders, told IPS, pointing at the green meadows surrounding her house. The ecovillage has also proved very popular among parents and children. “Being surrounded by so much nature has really been helpful. I know a lot about wildlife and plants – things that I wouldn’t learn at all if I lived in the city,” Ana Malina Ramanujan, 13, told IPS. The 160 residents are divided in two co-housing neighbourhoods, First Resident Group (FROG), created in 1996, and Second Neighbourhood Group (SONG), created in 2002. An additional neighbourhood, the Third Residential Ecovillage Experience (TREE), is currently being built. One of the ecovillage’s main goals is to achieve sustainability and a smaller ecological footprint through green building. “It’s a different way of living on the planet, one that makes sense,” Walker said. EVI’s houses consume 40 percent less energy and resources than similar households in the same climate zone, thanks to an efficient building strategy. FROG and SONG both have passive solar houses that are very well insulated and use the solar heat thanks to large south-facing windows. A 50kw solar panel also provides 30 homes with 66 percent of their energy needs. TREE will have passive houses, which boast even better insulation thanks to triple pane windows and a Heat Recovery Ventilator (HRV), which heats the incoming air with the warm exhaust air, allowing for 75 percent to 95 percent of the heat to be recovered. And the ecovillage is becoming greener with each new neighbourhood. “We all learn from each other and building new neighbourhoods allows us to use the latest technologies,” Walker explained. In addition to being more sustainable, EVI also has all the amenities of a modern urban neighbourhood, ranging from high-speed internet to parking spots. Not only is EVI a promising model for accessible sustainability, it is also a developing model for community and sharing. Steve Gaarder, one of EVI’s founding residents, was initially interested in the community feel of the village, but soon realised that sustainability would inevitably come with it. “The community really does help the sustainability happening,” Gaarder told IPS, enjoying the last hours of sunlight on one of the village’s wooden benches. “I don’t think it’s a coincidence that consumption has skyrocketed in the last 50 years while community has withered… They’re connected,” he added. “If you’re doing a sacrifice with others, you feel like you’re making a greater impact, it’s very encouraging. “For example, we decided not to put full-size ovens in our houses. Individually, very few people would have made that choice, but as a group, it felt good, we were all doing it. “Sharing is also very important: when you get rides from neighbours, you’re less likely to want another car,” Gaarder explained. The ecovillage residents consider themselves an extended family and several gatherings such as the biweekly community meal bring them together. “In my first two weeks of living here, I’ve made more friends than in my entire life,” Malia Becker, 13, told IPS. The community meals only serve locally-grown organic vegetables that come from a nearby farm. Located on EVI’s land, West Haven Farm has been a part of the ecovillage from the very beginning and feeds about 250 families. The 10-acre organic farm has developed a Community Supported Agriculture (CSA) programme, in which consumers pay a portion of the farm’s expenses and receive a share of the harvest in return. 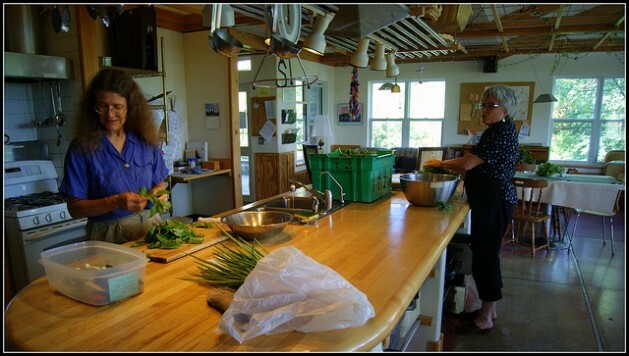 It allows the shareholders – many of whom live in the ecovillage – to enjoy organic seasonal eating and a greater connection to their food. Every Tuesday afternoon from late-May to early-November, the farm is buzzing with customers who come get their share of greens. “It’s lovely picking up your own vegetables! I immediately go home and start cooking, I’m inspired to use every bit of it,” Margot Schoeps, holding a bag full of greens, told IPS. The farm also grows flowers, which the customers pick every week. In the wooden shelter, which carries the smell of freshly baked bread, the shelves are stacked with garlic, peas, beans, and a number of other vegetables. Customers of all ages fill up their bowls with the week’s finest harvest before asking for the latest news about this year’s drought. “The CSA model is great because our customers share the bounty as well of some of the harder times,” Aviv Hilbig-Bokaer, a college student and a part-time worker at West Haven farm, told IPS. In addition to West Haven Farm, EVI boasts a small kitchen garden for every resident to use. “It’s really nice to have all those amenities. There’s this wonderful connection to place and land here that many people have lost in the modern world,” Walker told IPS. One of the first ecovillages in the world, EVI could be used as a model for a more sensible way of life, at a time when consumption is increasing. “Time has come for ecovillages. We cannot keep living in these individual dwellings,” Schoeps told IPS. “We want to translate the lessons that we’ve learnt from the 21 years of developing this ecovillage and translate that into mainstream development,” Walker added. “We can change the way we’re currently developing housing to a much more satisfying way of life.